Home recording has become easier than ever for us guitarists, thanks to amp modelling. One problem remains, though, and that's the matter of recording decent drums for your tunes. Drums are loud, physical instruments. They move air, and they need lots of microphones, preamps and cables to be recorded - plus there's the not inconsiderable matter of owning a kit, finding a drummer who can fly one and finding a space that's not only big enough, but sounds good too. Sampled drums used to come in two flavours: rubbish or rubbisher. These days, there are loads of brilliant sample libraries available for acoustic drum sounds. As a minimum, look for four- or five-piece kits containing multi-layered samples per-drum/cymbal. To replicate the drummer, you have to think like the drummer. Fortunately, this is pretty easy. When programming parts, think about the way a drummer plays. Crashes on the first beat of the bar? Open hi-hats in the chorus? Keep it realistic, too - only program parts that are physically possible with four limbs. 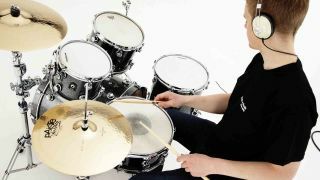 Drummers don't hit every note with the same power and volume, and this can radically control the sound of an acoustic kit. You need to adopt this approach with your programming to avoid fake-sounding 'machine-gunning'. This is done by tweaking the 'velocity' of each hit in your DAW. Most sample libraries will also let you program hits on different areas of a drum - for example, a snare drum sidestick, centre-hit or rimshot. With velocity settings taking care of your beat's dynamics, you'll want to look at feel. This refers to where your hit falls in relation to the beat. Heavily quantised parts that are bang-on the beat or sub-division sound mechanical, and it's the ever-so slight imperfections in timing that will make your drums sound human. Clicking the notes in with a mouse is a no-no. Instead, consider playing them in with a keyboard or pad controller. You can do this one hit at a time, then overdub each drum. Modern drum samples don't just give you the close mics for each drum; you'll usually find overheads and room mic sounds, which can be blended into your overall sound too. Used to just the right level, these sounds can act as the glue that binds your overall kit sound together, instead of sounding thin, fake and amateurish. The daddy of the Toontrack family, Superior has grown into a one-stop shop for killer drum sounds. The basic package comes with 20GB of samples for you to program, captured in world-class studios by big-name producers. There are also eight expansion packs available, covering styles from jazz to metal. Fancy getting John Bonham's drum sound? How about kits inspired by AC/DC, Nirvana, Dream Theater and more? That's what Steven Slate Drums 4 provides, along with loads of other kits themed around genres. There's also a more affordable, expandable EX version, allowing you to upgrade to different kits later. The appeal of this program lies in its simplicity. While you still get detailed drum sounds, they aren't as demanding on your computer's CPU. As well as programmable kits, EZ Drummer comes with an arsenal of beats and fills played by a real drummer. Because the grooves use MIDI data, you can adjust the tempo to fit your project. Every drum in your sample library has a corresponding MIDI note. Load your drum sampler into a track in your DAW and open the MIDI editor. We'll start by placing a kick drum (C1) on beats one and three. Next, add your snare drum (D1) on beats two and four, and tap in a hi-hat (F#1) part on every quaver. Notice how it sounds mechanical? That's because our sounds are all exactly the same level, and perfectly placed on every sub-division of the beat. Tweak the velocity levels. We're going to accent each downbeat on the hi-hats by reducing all of the 'and' notes. You can add realism by playing ghost notes at a lower velocity level on the kick and snare. Add some ambience from the room mics for a sense of space. The LaunchKey controller features 25 touch-sensitive keys, 16 pads and eight rotary controllers. You can use it for much more than inputing beats, and it'll connect to an iPad using the camera connection kit. If you'd prefer a simplified option, Korg's slimline NanoPad 2 gives you 16 assignable drum pads and an X-Y controller. It's USB, and can also work with an iPad. The NanoPad is available in two colours (black or white) and comes with a free copy of EZ Drummer Lite. Sometimes, you just want to hit things with sticks, and the Alesis SamplePad will provide you with the closest experience to playing your parts on an electronic drum kit. There are four pads, plus you can attach a bass drum trigger. The PercPad has percussion sounds built in, but works with a MIDI cable, so you'll need a MIDI interface to get the notes into your computer.